One of the best parts of the day is that six-eight hours of sleep each night, but that can be interrupted by the constant creaking and wobbling sounds your bed makes every time you move. With the Amish Crystal Lake Bed, loud creaking and consistent wobbling are nonexistent due to it being constructed with solid hardwood by expert Amish builders. The Crystal Lake Bed is handcrafted by Amish woodworkers in Ohio, who build each bed to the specification of the customer. The size of the bed, wood type, and finish used are all up to the customer to decide. 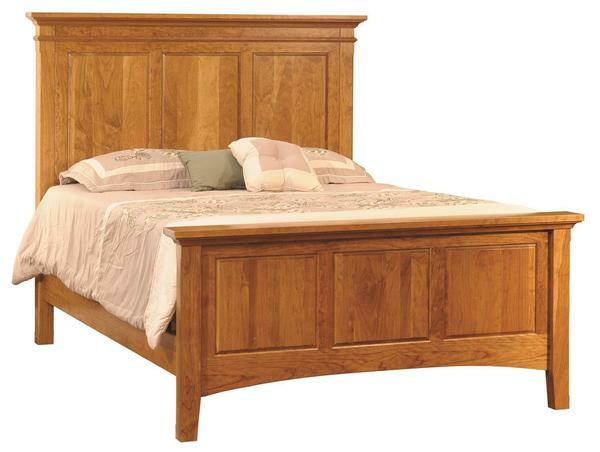 Although a simple and transitional style of bed, the detailed woodwork of the Amish craftsmen is apparent in the carved out panels of the head and footboard. The smooth edges and natural grains of the wood provide it with a simplistic beauty that every home desires. Wood and stain samples are available for those uncertain of which wood and stain options would work best in the bedroom. Contact one of our Amish Furniture Specialists with any questions you may have at our toll free number: 1 (866) 272-6773. You can also send us an email at Questions@DutchCrafters.com. We have a fully staffed team of professionals who will be happy to walk you through the ordering process and help with any questions that you may have.